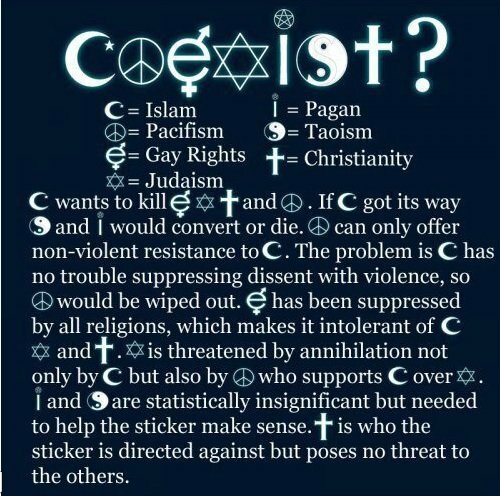 This entry was posted in culture, Fun, Islam, Israel, politics and tagged Christianity, coexist bumper sticker, coexist poster, Fun, gay rights, Islam, judaism, pacifism, religions on October 5, 2011 by Karen Hancock. This is great! I’ve often pondered this bumper sticker, along with another common one, “Tolerance,” that starts with the cross. It struck me as sadly amusing that both one begins with the cross and the other ends with it, and only through the cross can those words actually make sense. I’ve seen this but the thing is GayRights is not a religion, it is a lifestyle. I am for gays having equal rights but just don’t understand why it is on a poster with religious symbols. If we include gay rights as a religion then would should include other life style alternatives and beliefs. Just my opinion.